People move in the direction of their currently dominant thought; it’s a fact of life. If any of your people think they can’t do something, then it won’t get done. Recruit, select, hire, and train employees who believe they can make a contribution to the accomplishment of your business mission and goals. It’s a harmless admission, but it leaves you feeling a little empty if you are paying people to know, doesn’t it? Maybe if they said, “I don’t know right now, but I’m working on it, and I’ll get back to you soon,” that would have been a more proactive response. Do you really need people who just don’t know? 3. I’m sorry I’m late. Really? No, they’re not sorry. 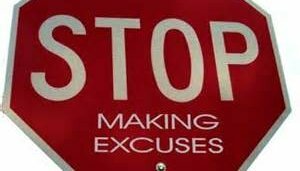 Sorry is a lame excuse masking an absence of personal and professional accountability. Ever hear of a Navy SEAL saying, “I’m sorry I’m late?” It doesn’t happen. Employees who can’t show up for meetings on time, submit reports promptly, or return customer’s calls in an expeditious manner, for example, will eventually make YOU really sorry you hired them. 4. Why do I have to do this? When it’s time to move forward with a process, policy, or plan of action and the apathetic response from a team member is, “Why do I have to do this?” — are you really enamored with their sense of buy-in and commitment? A drop of vinegar ruins a quart of milk; one employee reluctant to embrace team goals eventually destroys what really matters to your entire company. 5. I’ll just do it my way. I wonder what it would look like if all five hundred employees in a company said, “I’ll just do it my way.” That may have worked for the Lone Rangers of a bygone corporate establishment, but it doesn’t get the job done in our twenty-first century marketplace. Chaos and failure are the results of rogue employees who understand what the goals of a company are, and then employ their unique machinations for accomplishing them. Listen for these five phrases during your day-to-day activities at work and when you hear them, take corrective action immediately. Continuing to allow momentum killers to cripple your team may result in a disaster of epic proportions.